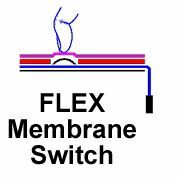 Of the five categories of membrane switches the most common is the Flex Membrane Design. This construction incorporates the conventional thin, flexible, polyester or polyimide circuit layer. This allows efficient manufacturing producing many circuit images rapidly using screen printing or etching processes. Even though the entire switch package is made from flexible materials there are many options available. The keys can be made to provide either a tactile sensation or no sensation at all (like on most microwave ovens). Metal domes or formed polyester domes are used to provide a tactile response to the keys.